I had discussed in the past about Bell’s theorem and his inequality for a local realistic theory. Also I have discussed the impossible noncontextual coloring game of Kochen and Specker. The Kochen-Specker theorem is very striking, but it has a major weakness: it cannot be put to an experimental test. Why? Because the coloring game can succeed when there are errors in aligning the measurement directions and no experiment is perfect. In other words, it is not a robust result. Bell inequalities are amenable to experimental verification and supporters of local realism argue then about experimental loopholes (I’ll cover them in future posts). It would be nice if there is a robust argument like Bell’s theorem but just as compelling as the Kochen-Specker theorem. Any attempt to explain them using local realism fails because if local realism holds, each measurement is causally independent of the others (locality), and each value “m” has a definite value prior to measurement (realism). Only then we can multiply the last three equations arriving at a contradiction with the first one. We continue the prior guest post by Ruth E. Kastner (@rekastner http://transactionalinterpretation.org ) with part 2. Ruth is an expert in the Transactional Interpretation of Quantum Mechanics. She recently published a book on this topic. Part 1 of this guest post discussed how the Transactional Interpretation (TI) can explain quantum measurement, including the Born Rule for probabilities of outcomes. In this part, I’ll show how TI survives a challenge raised by Tim Maudlin. I’ll also discuss my extension of TI into the relativistic domain. That extension clarifies what an absorber is, and as an added bonus, explains how the macroscopic world emerges from the quantum level. Maudlin’s challenge is intended to undermine the idea of a well-defined ‘competition’ between absorbers. Here’s the thought experiment (illustrated in Figure 1): a source emits offer waves for a slow-moving type of particle. The offer wave has rightward and leftward components. Figure 1. The Maudlin challenge. However, the left-hand absorber B is moveable, and it starts out on the right behind A. It will only be quickly swung around to the left if A does not detect the quantum by the travel time needed for the quantum to reach A, in which case the rightward transaction has failed. If this occurs, B will just be picking up the actualized quantum already headed for the left. Note that B cannot return a confirmation from its position behind A, so B never returns a confirmation when the quantum is detected at A. 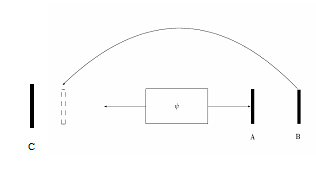 If the incipient transaction with A fails, then the quantum is certain to be detected at B. Maudlin argued that this scenario makes the transactional account inconsistent because he considered the weights of the incipient transactions as probabilities that apply to detection at specific detectors. 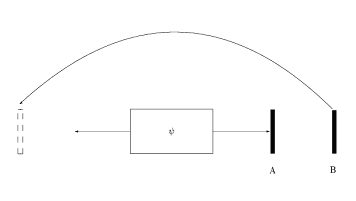 In this scenario, detector B is certain to detect the quantum whenever it is swung around, even though that leftward incipient transaction only has a probability of 1/2. There are a variety of solutions to the Maudlin challenge. But perhaps the simplest was suggested by Marchildon (2006), and that’s what I’ll present here. He noted that the direct-action picture, as developed by Wheeler & Feynman (1945, 1949) and Davies (1970-2), assumes complete absorption of all emitted fields – otherwise, it is not guaranteed to be empirically equivalent to standard theories of radiation or to observed radiation phenomena. So Marchildon includes a remote background absorber C, which always responds with a confirmation to the leftward offer wave (see Figure 2). Thus we always have two incipient transactions, each with probability ½, and these correspond to the frequencies of detection on the right and the left. there is always a confirmation from the left. The probabilities also need to be understood as applying to the quantum itself, not to specific detectors. This makes sense because each offer and confirmation embodies specific physical quantities that are actualized when that incipient transaction is actualized. So we have a probability of ½ that a quantum with leftward momentum will be actualized, and a probability of ½ that a quantum with rightward momentum will be actualized, and there is no inconsistency. It does not matter whether B or C receives the actualized quantum. Other worries surrounding the Maudlin challenge involve possible causal loops, but these are eliminated when we get away from the typical (but unnecessary) ‘block world’ picture. In my development of TI, offer waves are physical possibilities, not spacetime events. Only actualized transactions correspond to spacetime events; indeed, this is how events are brought into being. The relativistic domain, rather than presenting a problem for TI, actually resolves some issues facing the original, nonrelativistic version. This is in stark contrast to other interpretations that struggle with a relativistic extension. The relativistic domain addresses interacting quanta, and it is in these details that we find a quantitative basis for both the emission of offer waves and the absorption of those offers, which generate confirmations. 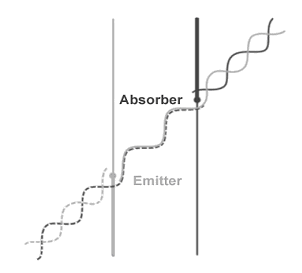 This allows us to answer the question “What is an emitter?” and, probably the more pressing question: “What is an absorber”? We find those answers in the relativistic coupling between fields. As Feynman noted in the context of quantum electrodynamics (QED), the coupling constant is the amplitude for an electron to emit or absorb a photon (Feynman 1985, p. 129). In the transactional picture, these correspond to the emission of an offer wave or the generation of a matching confirmation, respectively. The coupling constant is only ~0.085 (and is further reduced in practice by additional requirements involving the relevant conservation laws). Moreover, the applicable probability is the fine-structure constant , 1/137 (the square of the coupling constant), less than 1%. This tells us that neither emission nor absorption is very likely for any individual quantum. But the more potentially emitting or absorbing quanta that comprise an object, the higher the probability of emission or absorption by that object (see §5 of this paper). Let’s focus on absorption: it turns out that once you have an object composed of enough potentially absorbing entities that the probability of its generating a confirming response to an offer wave approaches unity, what you have is a macroscopic object. For example, a potential absorber is an atomic electron in its ground state. If you took about 100,000 ground state atoms, they would make up roughly the width of a human hair. This many atoms as components of an object would virtually guarantee the generation of a confirmation somewhere in that object, since the probability that none of its 100,000 component ground state electrons responds to an offer with a confirmation is nearly zero. Such an object can be unambiguously identified as an absorber. (But that doesn’t necessarily mean that it will be the one receiving the actualized quantum resulting from the ‘winning’ actualized transaction). So we see that quantifying the emission/absorption process via relativistic coupling gives an account not only of what constitutes an emitter or absorber, but also of the emergence of the macroscopic objects that are those emitters and absorbers. Thus, in TI we resolve the issue of the ‘HeisenbergCut,’ we gain a physical account of measurement, and we can read off Von Neumann’s theory of measurement and the Born Rule. More details are available in my 2012 book. Cramer J. G. (1986). ``The Transactional Interpretation of Quantum Mechanics.'' Reviews of Modern Physics 58, 647-688. Davies, P. C. W. (1970). “A quantum theory of Wheeler-Feynman Electrodynamics,” Proc. Cam. Phil. Soc. 68, 751. ___________(1971).”Extension of Wheeler-Feynman Quantum Theory to the Relativistic Domain I. Scattering Processes,” J. Phys. A: Gen. Phys. 6, 836. ____________(1972).”Extension of Wheeler-Feynman Quantum Theory to the Relativistic Domain II. Emission Processes,” J. Phys. A: Gen. Phys. 5, 1025-1036. Feynman, R. P. (1985) QED: The Strange Theory of Light and Matter. Princeton University Press. Kastner, R. E (2012a). The Transactional Interpretation of Quantum Mechanics: The Reality of Possibility. Cambridge: Cambridge University Press. Kastner, R. E. (2012b) “The Possibilist Transactional Interpretation and Relativity,” Foundations of Physics 42, 1094-1113. Kastner, R. E. (2006). “Cramer's Transactional Interpretation and Causal Loop Problems.'' Synthese 150, 1-14. Marchildon, L. (2006). “Causal Loops and Collapse in the Transactional Interpretation of Quantum Mechanics,” Physics Essays 19, 422. Maudlin, T. (1996). Quantum Nonlocality and Relativity: Metaphysical Intimations of Modern Physics. (First Edition), Wiley-Blackwell. Wheeler, J.A. and R. P. Feynman, "Interaction with the Absorber as the Mechanism of Radiation," Reviews of Modern Physics, 17, 157–161 (1945). Wheeler, J.A. and R. P. Feynman, "Classical Electrodynamics in Terms of Direct Interparticle Action," Reviews of Modern Physics, 21, 425–433 (1949). Maudlin first presented his challenge in his (1996). E.g., Kastner (2006), Kastner (2012, Chapter 5). I discuss these points in Chapters 5 and 8 of my book. E.g., the Bohmian and ‘spontaneous collapse’ interpretations which modify the basic theory by introducing an ad hoc nonlinear term in the basic Schrödinger evolution. This is because both emission and absorption are required – neither happens without the other in a direct-action picture. Also forthcoming from Imperial College Press: my next book on TI, a popular account for the general reader. Today I have the privilege to host a guest blog post by Ruth E. Kastner (@rekastner http://transactionalinterpretation.org/ ) who is an expert in the Transactional Interpretation of Quantum Mechanics. She recently published a book on this topic. The Transactional Interpretation of Quantum Mechanics (‘TI’ for short) was proposed by John G. Cramer in the 1980s (Cramer’s comprehensive 1986 presentation is here). The distinguishing feature of TI is its ability to ‘read off’ the Born Rule for the probabilities of measurement results from the basic formalism. How does it do this? By including the solutions of the advanced (negative energy/time reversed) Schrödinger Equation, as well as the retarded solutions of the usual Schrödinger Equation. The Wheeler-Feynman theory accounted nicely for ‘radiative damping,’ or loss of energy by a radiating charge. This could only be accounted for in the traditional theory (which assumes only a retarded field is radiated) by assuming an ad hoc sourceless ‘free field’. Wheeler and Feynman’s original motivation in developing this ‘direct action’ theory was to eliminate the field as an independently existing entity, to solve the problem of self-action in the classical theory – in which a charge interacted with its own field, resulting in infinite energies. They lost interest in it when they found that some degree of self-action was needed to account for relativistic effects (such as the Lamb shift). However, the direct action picture can still be used, and in fact Davies developed a direct-action picture of quantum electrodynamics in the 1970s (Davies 1970, 1971, 1972). The transactional interpretation is an application of the direct action picture to quantum systems. It departs from the Wheeler-Feynman (WF) classical picture in the fact that, instead of being a continuous quantity, energy can only be delivered in discrete packets (quanta). The usual retarded quantum states, such as |Y>, are called offer waves (OW) and the advanced states, <F|, are called confirmation waves (CW). Since TI deals with quantized energy and momentum, many absorbers may respond with CWs to an emitter’s OW, but (for a one-quantum OW) only one of the responding absorbers can actually receive the energy. But this quantized version of the WF picture allows for a very nice resolution of the notorious ‘problem of measurement’: namely, it allows one to ‘read off’ the heretofore mysterious ‘Process 1’ of John Von Neumann’s theory of measurement, which also contains the Born Rule. We’ll now see how this works. The coefficients |cn|2 are the probabilities given by the Born Rule for each of the outcomes yn. Thus, by including the advanced responses of absorbers, we have a physical account of measurement as well as a natural explanation of the Born Rule and Von Neumann’s ‘Process 1’. The response of absorbers is what creates the irreversible act of measurement and breaks the linearity of the basic deterministic propagation of the quantum state. Since the conserved physical quantities can only be delivered to one absorber, there is an indeterministic collapse into one of the outcomes y k with a probability given by the weight |ck|2 of the associated projection operator |y kñáy k |. This is called an actualized transaction, and it consists in the delivery of energy, etc., to one absorber. I see this is a form of spontaneous symmetry breaking (this is discussed in Chapter 4 of my book). 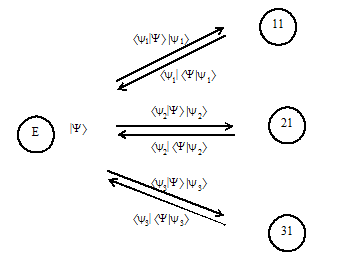 I have been developing the transactional picture in two specific ways: (1) investigating what kind of ontology underlies the offers and confirmations, especially when these are multi-quantum states: and (2) extending TI explicitly into the relativistic domain to give a more detailed account of emission and absorption, both of which are inherently relativistic processes. Both emission and absorption play crucial roles in defining the measurement process. Only the transactional picture, in which absorption contributes advanced states, provides a physical basis for what is otherwise an ad hoc mathematical recipe (Von Neumann’s ‘process 1’ and the accompanying Born Rule). In Part 2, I will discuss my recent developments of TI. Further information and discussion is available at my website (http://transactionalinterpretation.org/ ). Kastner, R. E (2012). The Transactional Interpretation of Quantum Mechanics: The Reality of Possibility. Cambridge: Cambridge University Press.Wheeler, J.A. and R. P. Feynman, "Interaction with the Absorber as the Mechanism of Radiation," Reviews of Modern Physics, 17, 157–161 (1945). Meanwhile, the infinities resulting from self-action are being ‘tamed’ by renormalization techniques. One of the important results in quantum mechanics is the teleportation protocol. There are several misconceptions about teleportation, fueled in part by Star Trek episodes. For example, you cannot teleport faster than the speed of light. Quantum mechanics exhibits correlations above what can be expected by a causal local theory and an experiment here can obtain data instantaneously correlated with an experiment located at the other side of Milky Way. To verify the correlation however, one needs to physically travel from here to there and this can only be done at speeds below the speed of light. Quantum mechanics is non-local, but it does not permit violation of special theory of relativity. Just because one measures something over here it does not carry any instantaneous signals across the galaxy (this is usually called no-signaling). Then, unlike in Star Trek, the teleported object does nor vanish. Instead, all its information is extracted and in the process the object gets destroyed. From the extracted information, the quantum state is reconstructed at the destination using local materials. In a way, it is like breaking up an apply pie to extract the baking instructions, and then using those instructions re-baking the pie at the destination using local ingredients. If you are teleported, you will die on the teleporting pad, and hopefully your complete atom state information is transmitted and used to make up an exact replica of yourself at the destination. A few mistakes in measuring and reconstruction and you will end up like someone from a Picasso painting-not an appealing prospect. So what is the big deal then with quantum teleportation? Is there any difference between a fax machine and a quantum teleportation device? In the quantum world there are two basic barriers. First, in quantum mechanics a state cannot be copied (cloned). The no cloning theorem means that a classical fax machine is impossible to be implemented in the quantum realm. The second roadblock is that measuring the quantum state destroys (or collapses) what it is measured and you cannot access all of the quantum state information. So it was a very exciting time when the teleportation protocol was discovered. This protocol can enable future quantum computers to transmit quantum information. But how does it work? We can start with the mathematical description (see here ) but it is much more entertaining to repeat a funny story originally told by Charles Bennett, one of the discoverers of teleportation. I could not find a good reference for this story, so I will tell it from memory attempting to be as close as possible with the original story (I originally blogged about this at FQXi and I had a link there to Bennett’s story but the link is now broken). Teacher: What color is the grass? Another Teacher in another room: What color is the grass? Now as the story goes, a murder was committed in Boston and the FBI wants to talk with the sole witness. They do not trust the local cops, and since the witness is still in a state of shock, they cannot transport him to Washington DC to be interviewed by FBI experts because they risk tampering the brittle witness’ state of mind. Fortunately Romulus happens to be in Washington DC and Remus in Boston. Then they ask Remus to spend time with the witness talking about any topics they want: the weather last weekend, the best movie showing right now, the stock market, etc. So Remus spends an hour with the witness and at the end of the hour, the witness said he hates Remus because he dislikes every single thing Remus likes. Moreover, the stress of the meeting has completely erased his recollection of the crime. Can the FBI agents in Washington DC have any chance to find out about the crime? Surprisingly the answer is yes. They will ask Romulus about the crime (he did not witness anything; he was in Washington DC all the time) and armed with the information about the outcome of the meeting between Remus and the witness, they reverse every single the answer Romulus provides them when asked about the crime and solve the case. Let’s say it again using quantum mechanics mathematics this time. This rewrite is the clever idea of teleportation. thus achieving the teleportation of the unknown original state from one place to the other. In the process we did not copy the state (the original state got destroyed) and the no-clone theorem was obeyed. Also we did not extract the coefficients α and β like in a classical faxing process. The memory of crime got teleported from the witness into the head of Romulus who for the purposes of the FBI investigation has become the witness. This was achieved by what is called quantum steering: measuring on one entangled particle changes remotely the state of its pair. This is instantaneous and can be done from one end of the galaxy to the other if you like, but in the absence of the right key to unlock the information it is useless. The key still has to travel slower than the speed of light and relativity is ultimately obeyed. I will now take a break from the prior series, and discuss a few fundamental results in quantum mechanics which were not given proper attention in the past on this blog. 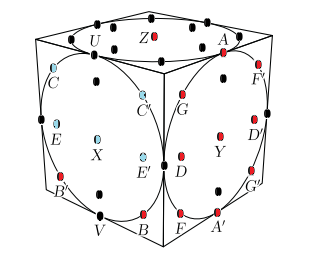 Today I am discussing the Kochen-Specker theorem, which rivals in importance Bell’s theorem. When you read about this result the first time, it looks a bit dry and abstract, but in fact it is child’s play because it is nothing more than a coloring game. Originally the first proof was quite intricate, but later on, the late Asher Peres found a great simplification and I will discus this instead. Before starting, we need one preliminary result: for particles of total spin 1, we can measure the square of the component of spin in a direction and get +1 or 0. So far nothing special, but quantum mechanics shows that if we perform such a measurement on three orthogonal directions (say on x, y, z) we will get two results of +1 and one result of 0. We do not know what result will be on which direction, but we will always get a zero result and two +1 results in some order. I’ll not prove this, but I want to look at its meaning instead. We know that in quantum mechanics the results of experiments do not exist before measurement, but can we create a model which will recover the 1,1,0 prediction for spin one particles? This will work for three orthogonal directions, but what if are adding additional orthogonal directions? If particles do have definite properties before measurement, it should be possible in principle to pre-assign the values of +1 and 0 to all our measurement directions in such a way that the +1,+1, 0 theorem is obeyed. The Kochen-Specker theorem shows that this is impossible. Now we can start the coloring game and prove the Kochen-Specker theorem. We will color the 1’s as red, and the 0’s as blue and see if this can be done in general or not. Step 2: X-A implies A = +1 because the center of the cube and X and A form orthogonal directions, and on any 3 orthogonal directions there can be only one zero which is at X now) In turn A’ = 1 because X, A, A’ form 3 orthogonal directions. Step 3: A,B,C form 3 orthogonal directions (this shows the cleverness of Peres’ choice for directions, try to prove using simple geometry that A,B,C form 3 orthogonal directions). Without loss of generality we can pick B=1, C=0. Now for the contradiction: U is orthogonal with V and you cannot have both of them equal with zero. So what does this mean? This shows that we cannot have a context independent assignment of measurement outcome before measurement. If we want to pre-assign measurement properties, this can only be done within the context of the measurement setting. K-S theorem weakens the idea of objective reality independent of measurement.